A month has passed since we started seeing clients and the center is BUSY, BUSY, BUSY! Our team of staff, trainees, interns, social work interns, students and filmers are in the full swing of things and the clinical year is off to a great start. Our staff members are recognized nationally and internationally as leaders in music therapy. This month, our managing director, Dr. Alan Turry, just presented at the Autism and Music Therapy International High-Level Congress in Bastia, France. On a side note, Alan has also been invited to serve on American Music Therapy Association’s advisory team on the value of music therapy for individuals with autism spectrum disorder. This team will be working on public awareness and education about this topic, as well as disseminating information on current researches and treatments for this population. 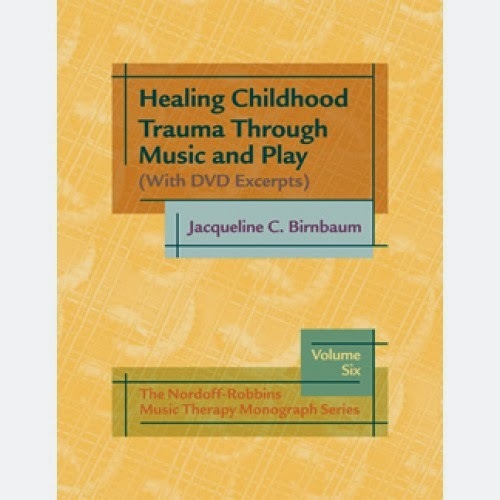 On another note, Jacqueline Birnbaum has an eBook published via Barcelona Publishers, and it is the latest book in the Nordoff-Robbins Monograph Series. This case study features Melanie, a four year old girl adopted from China who presented significant developmental delays and suffered from night terrors and fears of abandonment. Jacqueline integrates concepts from the realms of play therapy, attachment theory, trauma theory, and intersubjectivity to understand Melanie’s creative journey. The unique feature about this book is that it includes 29 video excerpts from the clinical process and you get to watch them as you read this fascinating case study. And it only costs $9!!! Click on the link below to purchase this book! New Clinical Year, New Intern Trainees, New Blogger! Hello everyone! It's a new clinical year and the center is as busy as ever! Jacqueline is taking a break from blogging and has handed over her mantle to me. My name is Ming Low. I just completed the Level 1 Nordoff-Robbins training in June 2013, and I am currently the research/technology assistant for the center. Many exciting things have happened since our last blog. The center just received the American Music Therapy Association's Arthur Flagler Fultz Award. It is a $15,000 research award in support of the center's ongoing research study on post-stroke recovery with NYU Rusk Institute of Rehabilitation Medicine's Motor Recovery Lab. This study aims to discover if a collaborative interdisciplinary music therapy and occupational therapy intervention can enhance upper limb functioning as well as psychological and social well being for patients post-stroke. We are now in the process of coding and processing the data we have collected and hope to publish and present the results of the study very soon! Not only that, the center is still involved in research projects with children with autism spectrum disorders, evaluating changes in children's communicative interaction over their course of music therapy. Some of our preliminary findings can be found in Early Childhood Music Therapy and Autism spectrum Disorders, (Kern & Humpal, 2012). Another research project we are working on is a collaboration with the New York Eye and Ear Infirmary. This study seeks to find out the effects of music therapy with the development of expressive and receptive communication of children with cochlear implants. The Nordoff-Robbins Center continues its proud tradition of providing clinical training for fieldwork students, music therapy interns, and Nordoff-Robbins certification candidates. This year, we welcome yet another group of wonderfully talented and dedicated students, interns, and candidates from all around the world to the Nordoff-Robbins family. Also joining our family are two social work interns from NYU's Silver School of Social Work to help us provide more comprehensive care for our clients and their families, and applied psychology students that assist us with video documentation of our clinical work. I hope to update this blog more frequently this year, and invite other Nordoff-Robbins music therapists to guest-blog for us. Sessions start officially September 16th, and we are all excited to make music with our clients! Please do not hesitate to leave comments or contact us if you have any questions, comments, or ideas about what you'd like to know more about us. We would love to hear from you! Greetings! Another clinical year is winding down, but here at the Center we are gearing up for a new year and a growing number of new projects. It has been an exceptionally busy few months for all of us. As an example, I had three special events/presentations in February and three in March: an interview by a Canadian radio station for a special program on music therapy; a presentation to students at Sarah Lawrence College on The Power of Music: Music Therapy in Action; guest lecturer for two different courses at NYU, Introduction to Music Therapy (Steinhardt) and Creative Arts in the Helping Professions (Gallatin Division); and a workshop for the students studying Nordoff-Robbins Music Therapy at Molloy College. Perhaps the most exciting event was participating in a symposium on The Autistic Mind, Music, and the Brain at SUNY Purchase. Nina Guerrero, Research Coordinator at the Center, and I presented on Nordoff-Robbins Music Therapy and Autism: Research and Clinical Illustrations. This one-day symposium explored recent research on enhancing cognitive functioning through music. After the other presenters discussed their research findings, Nina and I showed clinical examples of children with autism spectrum disorders in music therapy. This brought the subject alive, and we received wonderful feedback from many participants. Purchase hopes to make this an annual event, and we look forward to further involvement in the future. Last time I wrote about a number of research projects that are moving forward. In addition, we are also collaborating with the New York Eye and Ear Infirmary on a research project on children with cochlear implants. We are conducting a pilot study to see how music therapy impacts the children's musical perception, particularly with regard to pitch. Improved pitch perception helps children with language development. Alan Turry, Managing Director, recently gave the keynote address: Integrating musical and psychotherapeutic thinking: Research on the relationship between words and music in clinically improvised songs, at the Third International Music Therapy Research Conference in Waterloo, Ontario. Then he headed down to the University of Indiana to teach a week-long course in clinical improvisation. The staff of the Center are considered experts in the field of music therapy and are in high demand! Now we are saying our goodbyes to our clients for the year. It is always a time filled with mixed emotions: feeling sad at the year's ending, while celebrating all our clients have achieved. We wish everyone a restful and safe summer. We won't be resting at the Center, but rather planning for the coming clinical year and embarking on projects such as digitalizing our archives and scanning our files. My granddaughter is loving her new wading pool, splashing and pouring while staying cool. May all our days be filled with little delights. I hope this message finds you well and that you are keeping warm during the bitter weather. Time certainly has a way of slipping by! My granddaughter is now nine months old, crawling everywhere, thirsty with curiosity about the world around her. It is refreshing to see the world through her eyes, where everything is new and holds endless wonder. As therapists that is part of our work, immersing ourselves in our clients' experience so that we can gain a deeper understanding of their inner worlds. There are a number of new developments at the Nordoff-Robbins Center since I last wrote. We are involved in several research projects: one involves the development of a new research tool, the Music Therapy Communication and Social Interaction scale (MTCSI). The MTCSI is designed to measure the communication and social interaction behaviors that a child demonstrates during a music therapy session, and tracks the behavioral changes that occur over the course of music therapy with a child with developmental delays or related problems. It was developed by senior staff in collaboration with a consulting psychologist, Barbara Hummel-Rossi. We are now closer to establishing the validity of the MTCSI; research coordinator Nina Guerrero has been working with students both from the Nordoff-Robbins training program and the NYU Applied Psychology program, training them to use this new measure. Another research project involves the development of a scale measuring well-being in music therapy and how this leads to gains in other areas, such as positive changes in how people feel about themselves and a decrease in depression, for people who have suffered a stroke. For this project we are collaborating with Dr. Preeti Raghavan from the Rusk Institute of Rehabilitation Medicine at NYU Medical Center. Dr. Raghavan is a practicing physiatrist specializing in neurorehabilitation. The project also investigates the ways in which a client’s improved well-being may lead to functional improvement in regaining mobility after a stroke—it measures not only emotional but also cognitive and physical areas. We are very excited with these projects and contributing to the growing body of research into the benefits of music therapy. We are about to see the culmination of months of intensive work, as we complete the transition from videotape to digital recording. Paul and Clive had the foresight to tape their sessions when they began their work back in the 1950s, using what was available at that time, reel-to-reel tape recorders. Much of that early work has been transferred to CDs to make it available for study. Since we opened in 1990 we have been videotaping our sessions, using SVHS (Super VHS) tapes for our archives and regular VHS tapes for our working tapes, which we recycle at the end of each year. We were lucky to receive a grant which has covered the expenses involved in switching to digital recording. We have bought new cameras and computers to enable this transition. Ari Amir, our administrative assistant, has done a tremendous job overseeing this project. On a more somber note, you may know that Clive Robbins is currently in rehab after a long illness. We would like to extend our prayers and best wishes to him for his recovery. He is greatly missed here at the Center. We close at the end of next week for our winter break. Enjoy the holiday season, and best wishes for peace and prosperity in the New Year! It has been several months since I have posted a blog. I have been distracted by a tiny six-pound person who recently entered my life, my first grandchild. I was there to see her come into the world, and every new development--a smile, a coo--reminds me of the beauty of life, and the powerful need we share to connect with others. It is what we do at the Center every day: helping people connect with others, overcoming whatever barriers might stand in the way. Physical disabilities, autism, language delays, and more, challenge us to find new ways to foster meaningful communication and participation in the world. Yet music can do this! We are currently winding down our clinical year, as sessions end in June. We have already begun intake sessions, seeing potential new clients, and turning our attention to the summer and the coming year. This summer we are offering two courses for professionals to enhance their clinical improvisation skills. Groups from nearby colleges and universities, and groups from as far away as Korea, are coming to the Center to learn more about our work--we continue to be an important source of inspiration for professionals all over the world. Clive has recently returned from a two-month lecturing tour of Europe and Asia. His energy and devotion to music therapy are truly amazing! We missed him and are happy to have him back home in the Center. Enjoy the spring weather, and I promise to write again soon! It's that time of year again! I love the smell of the fresh trees for sale on Astor Place, and all the anticipation of the holiday season. And what would the season be without music? For me, hearing the holiday songs brings back memories of childhood: bundling up to go sledding, walking down to the lake for ice skating and hot chocolate, making the yearly trip into Manhattan to see the Saks Fifth Avenue windows and the tree at Rockefeller Center. It's another example of the power of music, and how music is intricately woven into the fabric of our lives. We have had two exciting fund raising events this past fall. On November 16, Richard Kogan, pianist and psychiatrist, gave a lecture/recital on George Gershwin. The setting was the magnificent Steinway Hall in midtown Manhattan. Guests were treated to a fascinating program that tied in the life of Gershwin to his music. Kogan's dynamic presentation and playing brought it all alive. He, in turn, was moved seeing video excerpts of work from the Center. On December 13, Nordoff-Robbins therapist Mikako Hirota organized a concert through her company Journey to Music. People contributed money to play at the concert, and the funds went to support the Center. Staff member David Marcus hosted the event, and Clive Robbins showed video examples of clinical work. Staff member Kaoru Robbins helped out, along with therapists Sunyoung Park, Jenny Fu, and Reika Yoshihara. All agreed the day was a resounding success. The positive energy was shared by performers and the audience alike. We appreciate your continued support as we strive to bring music into the lives of individuals with special needs. Best wishes to you for a peaceful and relaxing holiday, and a happy and healthy new year. It's hard to believe that we have only 2 more weeks left to the clinical year! June 27 is our last day of sessions. We will be saying goodbye to some of our clients who are completing their courses of therapy, as well as to many of our students. It's a time of mixed emotions, sad endings but also new beginnings. Now our thoughts are turning to the summer and to the 2009-2010 clinical year--our 20th. While we do not generally hold sessions during the summer, it is a very busy time for us. In addition to writing all our treatment summaries, we have intake sessions with potential new clients, meeting them in the music. Piecing together the clinical schedule and staff/student schedules is a mind-boggling puzzle. We do our best to accomodate the varying schedules of our clients, students, and staff, well over 100 people. We anticipate having a record number of students next year, including interns, Level 1 and Level 2 Certification candidates. Plus we try to find some time for vacation! This summer we are once again offering a course to music therapy students and professionals, entitled Nordoff-Robbins Music Therapy: Foundations, Improvisational Resources and Clinical Applications. This four-day course will take place July 13-16 and will cover 1) historical and philosophical foundations of the Nordoff-Robbins approach, 2) musical resources & techniques for improvising, playing and composing, 3) clinical application with a range of clients, and 4) supervisory feedback on participants’ current work. The course is currently full, but we are still accepting applications for a waiting list. For more detailed information, please visit our homepage. In August we will be hosting a group of Japanese music therapists for 4 days of workshops and lectures. In the past we have had groups from Korea, Scandinavia and other parts of the world come to learn more about our work and expand their own skills, while enjoying the "hot town, summer in the city." Please let me know if you have any ideas about how we might celebrate our 20th anniversary. It is also the 50th anniversary of Paul Nordoff and Clive Robbins's collaboration, and the 100th anniversary of Paul's birth. There's much to celebrate this year!